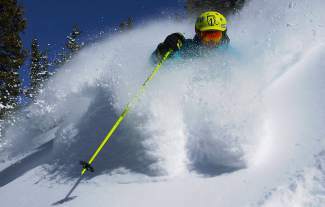 Skier Bruce Ruff of Golden, Colo., gets some face shots off Chair 1 at Loveland Ski Area. While it’s not unusual to see Subarus in the parking lot at Loveland Ski Area — or any of the ski areas in the mountains — this weekend you might see more of the Subaru brethren than usual making their way up Interstate 70 to the Eisenhower Tunnel. For more than 10 years, Subaru has held a Master the Mountain weekend at Loveland with fun events and giveaways. This year, the event has been re-branded and is now called Subaru’s Winterfest. While much is the same as before, Subaru has a new partner in Lib Tech, an American company that builds snowboards in the U.S. Free demos of Lib Tech snowboards are available throughout the event, which started on Saturday and runs through Sunday, March 9, at 3:30 p.m.
Skiers aren’t left out, either, and can demo skis from partner Nordica. Both companies’ tents are pitched at the base area near Lifts 1 and 2. This year includes an emphasis in safety, said Lamoureux. Twice a day, visitors can watch an avalanche beacon hunt demonstration, with trained avalanche rescue dogs. Skiers and snowboarders of all ages can test their maneuvering capabilities at the Subaru Freeride Experience Skills Course, with small trees and other objects to steer around. Family races are held at the top of Bennett’s Bowl, at the end of Lift 2, throughout the day. All are welcome to take part and enjoy a little friendly competition, the snowy slopes and the weather. “The weather, the snow, the conditions — everything is great,” said Duncan Maxwell, events coordinator at Loveland. The skies stayed that deep bluebird blue throughout the day Saturday, with only a few fluffy white clouds skirting the farther edges of the ridge and then disappearing. Conversations on the lifts revolved around the prime conditions. This reporter spoke with a mother from Colorado Springs who brought her family, including three children, up for the weekend. Though she had to battle some traffic on the interstate, she said the views and the snow made up for it. “We’re a super family-oriented ski area, for all ages and abilities,” Maxwell said. Those who are looking to improve their abilities can take a free mini-lesson during the Winterfest. Hour-long lessons in skiing and snowboarding from Loveland’s Ski and Ride School are available at 11:30 a.m. and at 1 and 2:30 p.m. all day Sunday, March 9. Brandy Cordova has been a seasonal worker at Loveland for 12 years and is a Level 2 certified snowboard instructor. She took a group of three snowboarders to try some green and blue runs on Saturday. “I love days like this,” she said, as the lift carried her and her students upward. On the way down, she called out tips and reminders, and it may be safe to say that each of her students definitely improved at the end of the hour. Winterfest activities are free to anyone with a lift ticket. Subaru owners can pick up some Subaru-related souvenirs at the big blue tent by showing their Subaru keys. Early-rising Subaru owners can even get front-row parking — the first 100 Subarus in the morning will be allowed to park in the first row, right by Lift 1. For more information, visit http://www.SkiLoveland.com/events.